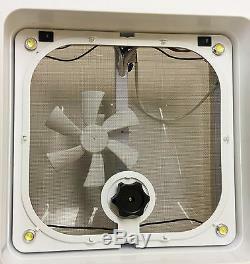 The 12v sky light features both a FAN and LED LIGHT. Size: 407mm x 407mm (Needs 360mm x 360mm hole). Height: 118mm - Height variation: 25mm - 70mm. 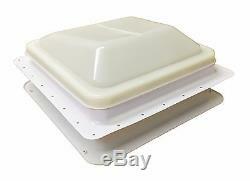 Translucent UV resistant dome - White frame. Removable mesh screen (flynet) keeps out flies and bugs. 12v (1.2A) Power supply. Fan - 10W LED light. Please see our other items added daily at unbeatable prices. 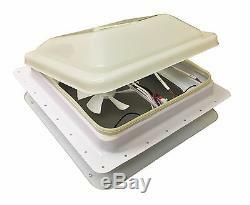 The item "CARAVAN ROOF VENT SKY LIGHT with 12v FAN and LED LIGHT motorhome camper boat" is in sale since Saturday, May 13, 2017. This item is in the category "Vehicle Parts & Accessories\Motorhome Parts & Accessories\Campervan & Motorhome Parts". The seller is "seaflo-uk" and is located in Cradley Heath, West Midlands. This item can be shipped to United Kingdom, Ireland.